Arithmetic mean (AM) is one of the measures of central tendency which can be defined as the sum of all observations divided by the number of observations. If all the observations assumed by a variable are constants, say "k", then arithmetic-mean is also "k". For example, if the height of every student in a group of 10 students is 170 cm, the mean height is, of course 170 cm. The algebraic sum of deviations of a set of observations from their arithmetic-mean is zero. for unclassified data, ∑(x - x̄) = 0. And for a grouped frequency distribution, ∑f(x - x̄) = 0. For example, if a variable "x" assumes five observations, say 10, 20, 30, 40, 50, then x̄ = 30. The deviations of the observations from arithmetic mean (x - x̄) are -20, -10, 0, 10, 20. 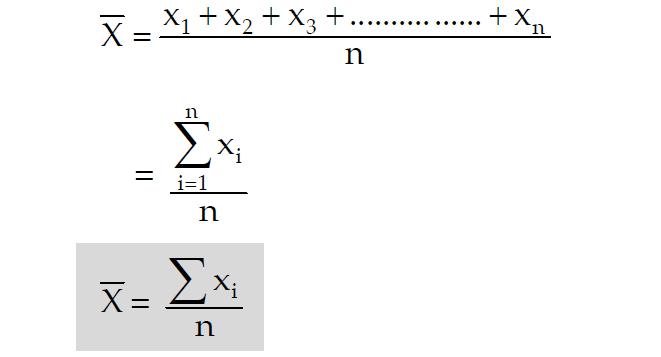 Arithmetic-mean is affected due to a change of origin and/or scale which implies that if the original variable "x" is changed to another variable "y" effecting a change of origin, say "a" and scale, say "b", of "x". That is y = a + bx. 1) It is rigidly defined. 2) It is based on all the observations. 3) It is easy to comprehend. 4) It is simple to calculate. 5) It is least affected by the presence of extreme observations. 6) It is amenable to mathematical treatment or properties. The above properties make "Arithmetic-mean" as the best measure of central tendency. However, arithmetic-mean has some draw backs. 1) It is very much affected by sampling fluctuation. 2) Arithmetic-mean can not be advocated to open en classification. 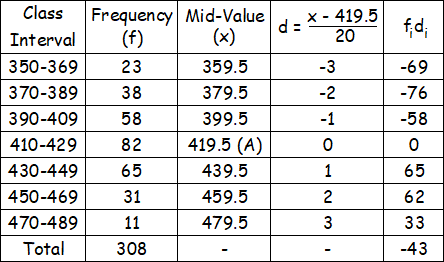 For open end classification, the most appropriate measure of central tendency is "Median. For the following data, compute AM. Compute the mean weight of a group of students of an university from the following data. 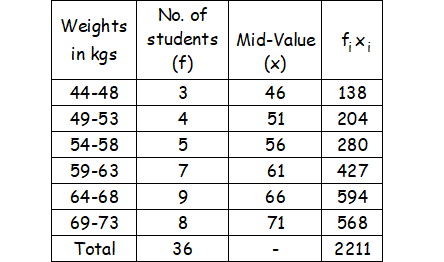 Computation of mean weight of 36 students. 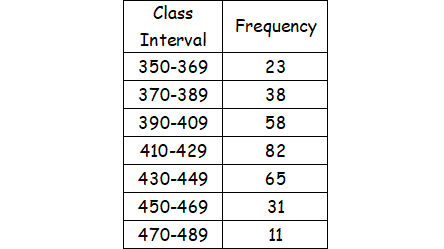 Find the AM for the following distribution. After having gone through the stuff given above, we hope that the students would have understood "Arithmetic-mean".